Last Saturday, Eleanor Catton was in Ottawa to promote her novel The Luminaries. The event took place at the Centretown United Church, a beautiful building with colorful stained glass windows, dark wood pews and a flower patterned red carpet. The author was dressed soberly in black pants and a light blue jacket. She started the event by reading two excerpts from The Luminaries, and then she sat down for an interview with Adrian Harewood from CBC Ottawa. In her novel, Eleanor Catton has an extraordinary command of the English language. For one thing, she wanted to write with the language of the time period in her book (1866). So she read novels from the 19th century to learn the vocabulary and phrasing used at that time. In particular, she read Murder on the Orient Express by Agatha Christie. In this book, she also noticed that the main character seemed to be always at the right place at the right time. Eleanor Catton thought it was very unlikely, so she decided to tell her story from the points of view of her 12 main characters. In addition, she arranged the plot around the zodiac, so each character represented an astrological sign. To make sure her book was historically correct, she used a computer software to determine the placement of the stars for the time period of the book. Furthermore, she decided that each chapter would be half the size of its predecessor, whereas the little summaries at the beginning of each chapter would get longer and longer. This was meant to give the impression of an eclipse. So she was very meticulous in her planning, and kept all sorts of files and diagrams on her computer. In the end, the author spent two years reading and researching before starting writing. As a general rule, she tries to write novels that she would like to read herself, and she wants to make sure that she keeps the reader interested throughout the book without giving too much away. In addition, she said that writers must always assume that their readers are smarter than them, and that they should avoid any condescension. Most of the time though, she found that dialogues were extremely difficult to write but she enjoyed doing it. Indeed, she revised dialogues a lot more than description or narration. When Adrian Harewood pointed out that she used the word “whore” a lot in the book, she explained that there were two reasons for this: first, she loves words with one syllable, and second, “whore” is very similar to the word “ore”, gold being the central subject of the book. In addition, the word conveys the violence that Anna, the prostitute, was subjected to on a daily basis. The Luminaries was the winner of the 2013 Man Booker Prize and the 2013 Governor General’s Literary Award, so all of a sudden, the author was thrust in the spotlight. At first, she was uncomfortable with the scrutiny that came with fame. It was very odd to her that she became sort of a spokesperson in New Zealand. She didn’t expect this at all. But now she is using her notoriety and the money she received from an award to set up a grant to encourage children in New Zealand to read and write. As a child, Eleanor Catton loved books written by Roald Dahl. She was also a fan of the Harry Potter series, and coincidentally was the same age as the main character. She has read the series three or four times, and it taught her a lot about writing. In fact, she didn’t have a TV when she was growing up, so she read, drew and wrote a lot. She still doesn’t have a television, but she occasionally watches TV on her laptop. This is kind of ironic because The Luminaries has been optioned for a TV series in Britain. Eleanor Catton has not read her novel since it was finished as she thinks it would be too unnerving, and she would probably want to change things. Not to mention that as she grows older, the book doesn’t. There is also a need to move on to other things. When I asked her to sign my copy of her first novel The Rehearsal (I purchased The Luminaries as an e-book), I enquired whether she had a new book project yet. She responded that she didn’t because she had been busy with promotion and speaking engagements but she hoped there will be one soon. I, for one, will make sure that I keep an eye out for future works by this author. To read my review of The Luminaries, please click here. 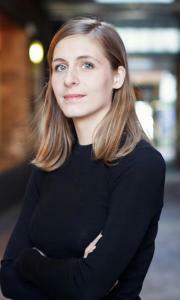 About the author and her work: Eleanor Catton’s Website.